Post-race Rock ‘n’ Roll Concert Series will take place following the race on Sunday, April 7 at Ghirardelli Square at 9:30 a.m.
TAMPA, Fla./SAN FRANCISCO, Calif. (March 18, 2019) – The Rock ‘n’ Roll Marathon Series® has announced exciting new course enhancements along with this year’s headline band for the 2019 United Airlines Rock ’n’ Roll® Half Marathon San Francisco. On Sunday, April 7, runners will be treated to a brand-new start line experience with more pre-race music, lights, and informational experience before heading out of Pier 35 to cross start line on The Embarcadero. The energetic Yacht Rock band, Mustache Harbor will take to the Rock ‘n’ Roll Concert Series Stage to close out a fun-filled weekend of running and music. The concert will be free and open to the public. This year’s start line will move back approximately 1,500 feet to just outside Pier 35 on The Embarcadero, which will allow for an enhanced pre-race kick-off with several all-new features for 2019. Runners gathering inside the Pier 35 will experience more amplified music, improved lighting and a comfortable pre-race experience before moving just outside to begin their race. The start line arch will also be set up in advance of the Health & Fitness Expo, giving runners an early look of how their race will begin. Mustache Harbor has a simple mission: to build a mustache army and create a Soft Rock Explosion the likes of which has not been seen since Christopher Cross, Steely Dan, Ace, Kenny Loggins and The Little River Band ruled the airwaves and created AM Gold. This local San Francisco Yacht Rock band welcomes runners and spectators to come dance, sing and party with them at the finish line! After runners cross the finish line, they will be treated to the sounds of Mustache Harbor at the finish line festival located on Beach Street in front of the Hyde St. Trolley station across from the Aquatic Park. Continuing a strong tradition of Bringing the Fun to the Run™ with great music at the core, the post-race concert will begin at 9:30 a.m. to celebrate a day of running, music and community. 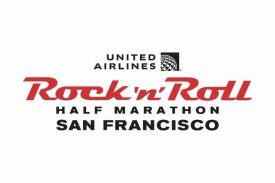 The musically themed United Airlines Rock ‘n’ Roll Half Marathon San Francisco will begin at 6:15 a.m. on Saturday, April 7. From the start line at Pier 35 to the Golden Gate Bridge, race participants will enjoy the best of San Francisco. This boutique bucket list race features a show-stopping course that will treat runners to picturesque views of the San Francisco Bay and is jam packed with music and entertainment from start to finish. Race weekend kicks off with the Health & Fitness Expo on Friday, April 5 from 3 p.m. to 7:00 p.m. and Saturday, April 6 from 10:00 a.m. to 5:00 p.m. at Pier 35. The expo will showcase vendors featuring the latest in running gear, nutrition and training. For information about United Airlines Rock ‘n’ Roll Half Marathon San Francisco, visit online at RunRocknRoll.com/San-Francisco. For more information about the Rock ‘n’ Roll Marathon Series, please visit www.runrocknroll.com. Media may contact press@runrocknroll.com. The Rock ‘n’ Roll Marathon Series® is the world’s largest running series taking part in over 30 destination events around the world every year. Established in 1998, the Rock ‘n’ Roll Marathon Series simple idea of making running fun has transformed both the U.S. and global running landscape by infusing the course with live bands, cheer teams and entertaining water stations, creating a block-party atmosphere for participants and spectators alike. Focused on running, music and community, race weekend kicks off with a free Health & Fitness Expo showcasing the latest in running gear, sports apparel, health and nutritional information and much more. Events culminate with an entertaining finish-line festival featuring some of the biggest names in music, with past performances including Macklemore & Ryan Lewis, O.A.R. Aloe Blacc, Pitbull, Flo Rida, The Band Perry, Fitz and the Tantrums, the Goo Goo Dolls and Bret Michaels. Further information about the Rock ‘n’ Roll Marathon Series can be found online at www.RunRocknRoll.com and follow @RunRocknRoll on all social platforms.